A past issue of Mary Engelbreit's Home Companion (August/September 2007) contains an article that I purchased the magazine for. Called "Ties to the Past" by Darci Smith, it features vintage aprons and tells all about them. Beautifully photographed aprons illustrate Darci's fine points. She says that an apron collector finds that if you listen closely, a vintage apron will tell you stories. In one sentence she encapsulated exactly why I find collecting aprons so interesting! I love to think about the life each apron might have led --- who stitched it, who owned it, when it was worn, and during what time era did it originate. Of course it's impossible to follow the history of each vintage apron found, but through careful examination it is possible to learn quite a bit about its past. According to Ellynanne Giesel, a true apronista extraordinaire, an apron speaks. She says that the spirit of the person who sewed or wore it is imbued in the fabric, within those threads. Each apron has it's story. It's up to the one who becomes the keeper of the apron to discover its history. Examine each stitching technique, date the fabric by using prints and colors to identify time eras, and use trims and buttons to help you date the period in which the apron was made. Like a treasure hunt, you'll be surprised at all the things you can discover about a vintage apron once you start looking for clues. Have fun! The apron in the picture above is Aunt Cella's and came from Grandmother Iva's apron stash. Full length, it appears to have been 'too special' for Grandmother to wear. Instead it was saved away in a drawer like many of her fine things were. Machine applique adorns the bib and pockets and little tidbits of applique are scattered above the hemline. Features that make this apron unique are the darts used to ease the fabric into the waistline and the pretty style of the pockets that are stitched into the side seams. In soft blue, it has a romantic sense about it with just enough contrast in yellow and pink to make it cheerful. What a pretty apron! I too love old aprons and have several, some from my mother and grandmother. I also have one I made years ago in home ec class with my name on it. This is a great apron, LaTea. I'm wondering if you are using it or if it's too priceless a keepsake for everyday wear? I enjoyed that same magazine article too. I don't have any old aprons, but many newly-ish made aprons that I wear all the time. My daughter once took a picture of me cooking in my apron because this is how she remembers me best -- apron clad. Funny! I love old aprons too! Can just imagine the dinners and meals that were prepared with love while someone wore that apron beautifully stitched and decorated. Love the post and I feel that same way each time I get an apron. I can just see the liitle lady fixing a meal for her family and the little ones around her feet. 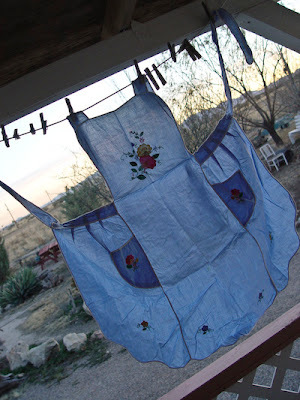 Well goodness, I stopped by to thank you for your comment on my wildflower post and I found this interesting post on aprons. I have an apron collection (mostly my grandmothers). So much to look at here - I need to go check out that sunbonnet sue over on the sidebar. At a luncheon held by a dear friend earlier this month she wore her apron the whole time. It was a fitting symbol of the care she takes with each detail and with the love she offers in friendship.